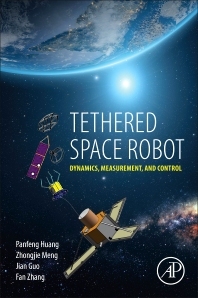 Tethered Space Robot: Dynamics, Measurement, and Control discusses a novel tethered space robot (TSR) system that contains the space platform, flexible tether and gripper. TSR can capture and remove non-cooperative targets such as space debris. It is the first time the concept has been described in a book, which describes the system and mission design of TSR and then introduces the latest research on pose measurement, dynamics and control. The book covers the TSR system, from principle to applications, including a complete implementing scheme. A useful reference for researchers, engineers and students interested in space robots, OOS and debris removal. Prof. Huang received B.S. and M.S. from Northwestern Polytechnical University in 1998, 2001, respectively, and PhD from the Chinese University of Hong Kong in the area of Automation and Robotics in 2005. He is currently a professor of the School of Astronautics and Vice Director of Research Center for Intelligent Robotics at the Northwestern Polytechnical University. His research interests include Space Robotics, Tethered Space Robotics, Intelligent Control, Machine Vision, Space Teleoperation. Dr. Meng received his Ph.D. from Northwestern Polytechnical University, China, in 2010. He is currently an associate professor at the School of Astronautics, Northwestern Polytechnical University. His research interests include dynamics and control of tethered space robots and intelligent spacecraft system. Dr. Guo received his PhD degree from University of Leeds in England and BSc/MSc degrees from Northwestern Polytechnical University in China. Before joined Delft University of Technology (TU Delft), he worked as Research Assistant in Tsinghua University from 2001 to 2004. He is currently a Theme Leader in TU Delft Space Institute (DSI) and an Assistant Professor in the Faculty of Aerospace Engineering, TU Delft. His research interests include small satellite, distributed space systems, and space systems engineering. Dr. Zhang received her MSc and PhD degree in Navigation, Guidance and Control in 2012 and 2017 form School of Astronautics, Northwestern Polytechnical University respectively. Her research focuses on the dynamic and control of Tethered Space Robot and maneuverable Tethered Space Net.